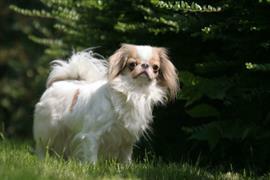 The Japanese Chin was revered by royalty in historic Japan. The breed was a symbol of status and owned by only those of noble blood. Many dog name ideas can be taken from the classic periods of Japan and the Emperors that ruled. Kofun, Asuka, Nara, and Heian are four names borrowed from periods in Japanese history. A few good names of rulers in the Kofun period are Ojin, Richu, Anko, Kenzo, and Senka. Some name options from the Asuka period include Kinmei, Yomei, Suiko, Kobun, and Saimei. The Nara period gives names like Gensho, Koken, Shomu, and Konin. Names derived from rulers during the Heian period are Heizei, Saga, Yozek, Koko, Kazan, Sanjo, Toba, and Nijo. Other unique options come from Japanese words. Suki (meaning love), Hana (meaning flower), and Saikou (meaning best) are just a few of the many available choices for female puppies. Hoshi (meaning a star), Kameko (meaning child of the tortoise), and Kioko (meaning happy child) are some popular Japanese dog names for a male. To have a little fun with naming, try to think of names of people with notable chins. John Travolta, Chevy Chase, and Kirk Douglas are a few famous people with well-defined cleft chins. Some of our pages will contain a subcategory. A subcategory is a slightly more specific grouping than the main topic of the page. For a subcategory, we will include a separated table of names and corresponding descriptions. An example of a subcategory of Red Dog Names would be 'Dog Names Inspired by Red Wines'. If you have any subcategory ideas for the Japanese Chin Names page, we would love to hear them. Use the form below to submit your ideas.